I will be honest, I never was terribly fond of dried legumes growing up, and until recently, apart from slow cooking the occasional bag of dried cannellini beans, or adding dried lentils to a pot of soup I often grabbed a can precooked beans to use when needed in a recipe. Yes, I admit that even I stooped to using canned beans all too frequently! I even would have considered chickpeas, more commonly called garbanzo beans in North America, as one of my least favorite foods because my only experience with them was to be served mushy, mealy canned beans on salads. Recently however, I have rediscovered dried beans and am actually shocked at how much better they taste than their canned counterparts. As well as tasting better, dried beans are loaded with vitamins, minerals, and fiber at a minimal cost, making me realize how cost efficient this nutritional powerhouse truly is. An entire bag of dried legumes is so inexpensive, yet once soaked and properly cooked that one bag of beans can be used in a number of dishes. Just recently, I have prepared chickpeas, lentils, cicerchie (an Umbrian specialty), and a small white bean from the Lago di Trasimeno area similar to a small cannellini called Fagiole del Pugatore, and used these delicious beans in soups and stews, in pasta sauces, or simply dressed as part of an antipasto tray. I have certainly developed an entirely new appreciation for dried legumes! Health Benefits: A fat free source of protein, all chickpeas pack a high dose of folate, B vitamins, and iron, and are thought to lower blood pressure and cholesterol making them particularly heart healthy. Dried beans also contain phytoestrogens that may reduce the risk of estrogen related cancers as well as pancreatic, colon, and prostate cancers. 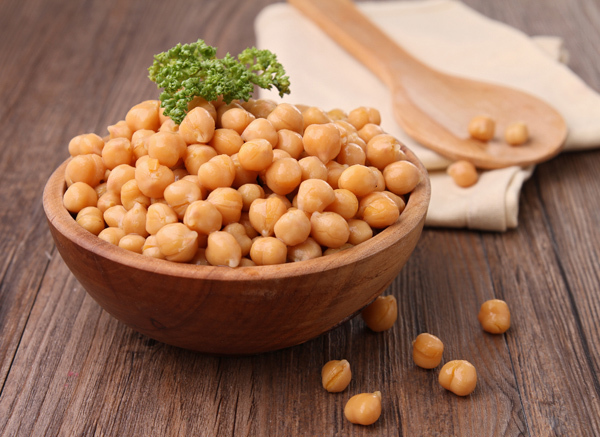 High in both soluble and insoluble fiber, chickpeas are a excellent choice for folks with diabetes, hypoglycemia, or insulin resistant diseases as they help to both lower and normalize blood sugar levels. To Buy: Buy unbroken chickpeas from a good source with a high turnover. Older beans take longer to cook and may break apart during the cooking process. If you choose to buy canned chickpeas, consider buying an organic, low sodium brand. To Store: Although beans do have a long shelf life, it is best not to mix newer beans with older ones as the older ones may require a longer cooking period. Store dried chickpeas in an airtight jar in a cool, dry place for up to a year. To Cook: Although a tad time consuming, cooking dried legumes is remarkably easy although they fare best if soaked overnight in a bowl covered with water and a pinch of baking soda. The next day, simply drain the water off and cook. I simply put my beans in a pot and add half an onion quartered, two whole peeled garlic cloves, and a stalk of celery, as well as one carrot, chopped into large pieces. I do add a fresh herb, rosemary being one of my favorites for white beans. I cover the beans with water, bring the water to a boil, then reduce to a simmer and cook until tender. The timing may take anywhere from half an hour to two hours depending on the type of bean you are cooking, and how old it is, so it is best to taste a bean every so often to check. When cooked properly, the bean should be tender, not mushy…..basically still requiring teeth to chew them! The one noteworthy thing to remember that I learned the hard way is not to salt your beans while they are cooking or the skin will toughen up. I found that after they cooled my beans all firmed up a bit anyway, and even the one time I thought I had overcooked my chickpeas, once cooled they were perfect. If you want, you could also fry up a little bacon or pancetta to season the beans, or if you are lucky enough to have one, throw a prosciutto rind into the pot. You can even cook a pot of beans, use some immediately, then freeze the rest already cooked to use in a soup or stew in the future, or store the cooked beans for up to five days in the refrigerator. Lentils, being much smaller in size, can simply be cooked in a soup or sautéed with broth and do not require prior soaking. Why not take the chickpea challenge yourself this week and add chickpeas to at least one of your meals, whether it be on top of a salad, in a soup or stew or as a side dish. I’m sure you too will discover how cost efficient and delicious this healthy little bean is!